This year’s winter senior pet goes to Abby Roberts, an 8 year old golden retriever. Abby was born on the east coast and brought to California to be a breeding dog. As she went through all the necessary certifications, they found that she had several heart valve defects that she was born with. Though her heart abnormalities were not causing any illness, she could not be a breeding dog. That’s when the Roberts family had the opportunity to give Abby her forever home. She came to them very shy and nervous. Her breeder described her as “kind of weird”. Her new family put a lot of love and time into helping Abby socialize and eventually she came out of her shell. 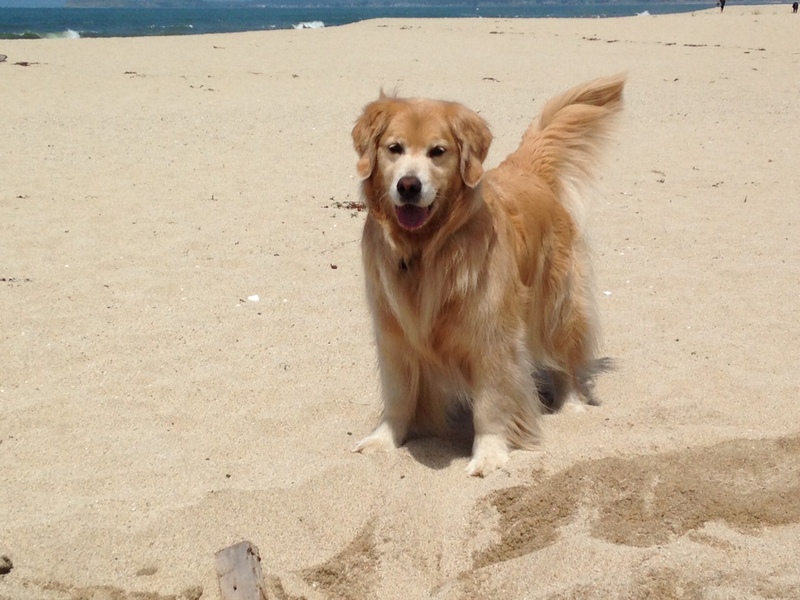 She is now a typical golden who loves excursions and meeting admirers where ever she goes. BCPH has been monitoring Abby’s health for years. Recently, Abby participated in BCPH’s Senior Care Level Two Program. Dr. Raymond did an annual exam, sent blood and urine to the lab for analysis, took x-rays, blood pressure, heart monitoring and eye tests. Abby has also been thoroughly examined by a cardiologist and there doesn’t seem to be a threat of any heart related illness. She does have some benign cysts on the iris of one of her eyes but it doesn’t seem to be causing any problems. She also has a bit of urinary leakage that can be common in spayed females. Both issues are manageable and we continue to monitor. Overall, Abby is a pretty healthy young senior. Abby spends a lot of time doing agility work and recently passed the test to become a therapy dog with Lend a Heart. She visits elderly people in retirement communities and sits adorably while children read to her. Abby’s favorite activities are swimming, playing fetch and sitting on her dad’s lap after dinner. She has a very sweet, affectionate personality and just loves to be with her family. We are proud to name Abby a super senior.